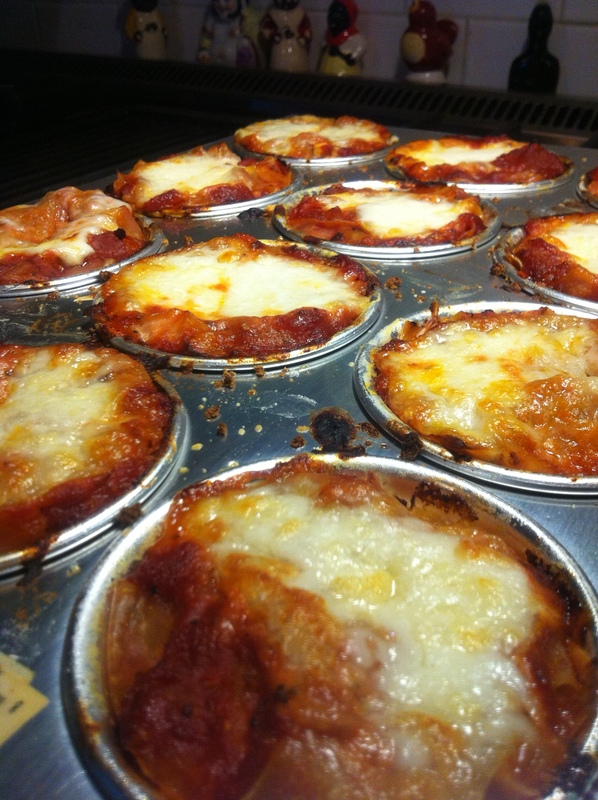 These lasagna cupcakes are super easy to make – once you have assembled the ingredients. You can also modify this recipe endlessly to reflect your own favorite lasagna recipes. The only real NEWS here is the concept of using a cupcake pan & using wonton skins instead of pasta. I am certain this can be made using actual pasta or adding meat or with a white sauce – whatever. Also – I tried this two ways – 1) leaving the wonton skins square & folding them down over the top creating little closed baskets and 2) cutting the wontons round with a cookie cutter so that they were layered more like a Neapolitan. The result was two more different little lasagnas than I would have guessed. The square wontons resulted in a cupcake far easier to remove from the tin (the round ones needed more cooling time to be removed & still retain their shape). Also – the added wonton quantity in just keeping the squares in tact made those cupcakes more bready – for lack of a better word. The round ones allowed the flavor of the sauce to come through more powerfully – primarily because there was less wonton flavor competing with it. Also – if you use a jarred sauce & store-bought ricotta – you could assemble a tray of these in the time it takes your oven to heat up & then cook these cook in under twenty minutes. They are elegant & different & EASY and pretty and delicious. This recipe below made 24 cupcakes. Each person I served had at least two. Serve with a nice salad & some crusty bread & a box of wine & you are good to go! This recipe is broken into three parts: sauce, ricotta & cupcakes. 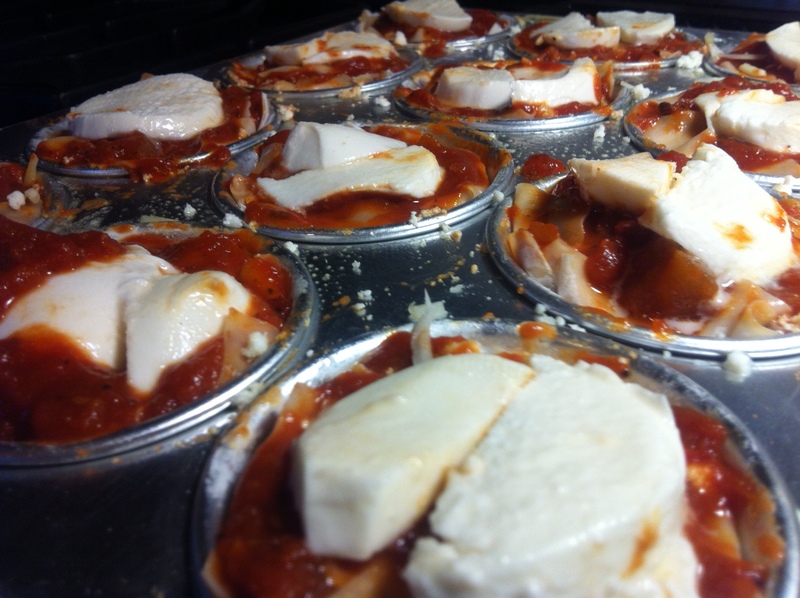 If you are using store-bought sauce & ricotta – buy two jars for the 24 cupcakes & 1 lb of ricotta. Also – I used some canned tomatoes in this recipe because I already had them. I will try to avoid using them in the future. Read why HERE. Heat the oil in a deep sauce pan. Saute all the garlic until the minced garlic begins to turn golden. Add the tomato paste & stir over high heat for about a minute. Lower the heat to medium & add the rest of the ingredients. This sauce was very spicy with the full TBS of crushed red pepper – so ease into using the red pepper & add more according to your own palette & tolerance. 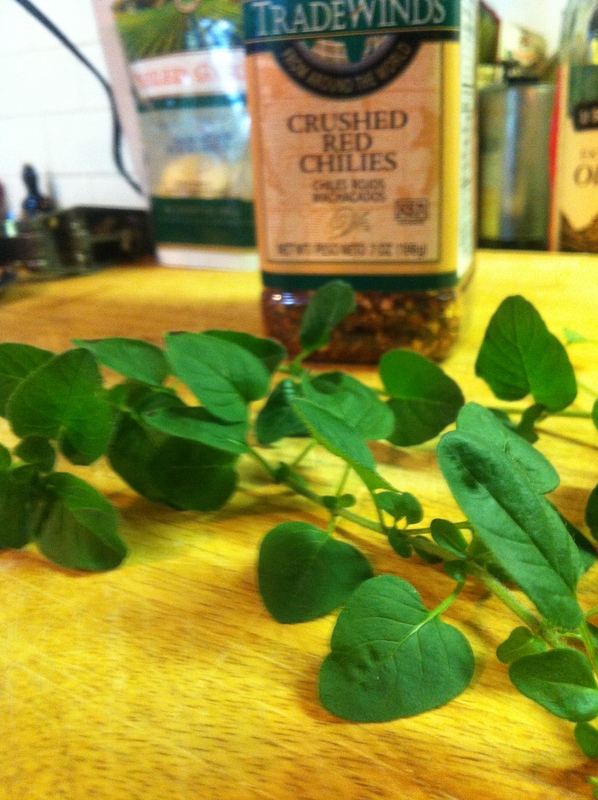 Bring this to a boil & then cover & lower heat to low & let simmer – the longer the better. I made this a day in advance & refrigerated it overnight – letting the flavors blend – but this isn’t necessary. Let it cool before assembling the cupcakes. Make this in two batches. Divide the ingredients in half & do it in two batches. For some reason – doing it all at once produces less ricotta. 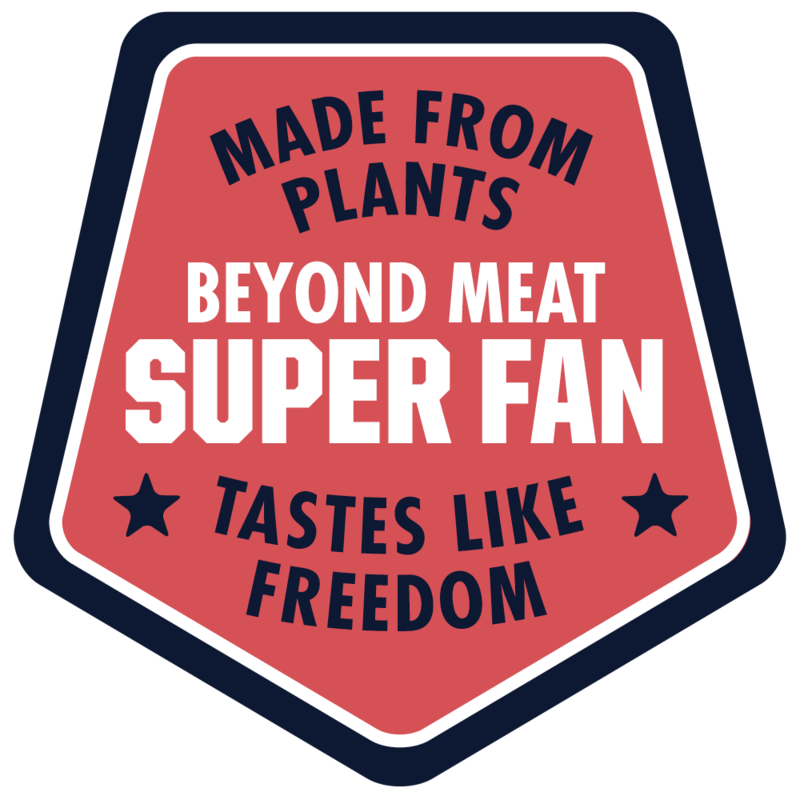 Sounds crazy – but my friend tried & agreed. Plus – the half batches are more manageable to dry in the cheesecloth. Heat half the milk & half the buttermilk in a pan. When it just begins to bubble in the corners – turn off the heat. Add half the salt & half the vinegar & stir. With a slotted spoon – scoop out the curds that form until all that is left is the yellowish whey. Alternatively – CAREFULLY pour the curdling milk through a cheesecloth-lined colander. 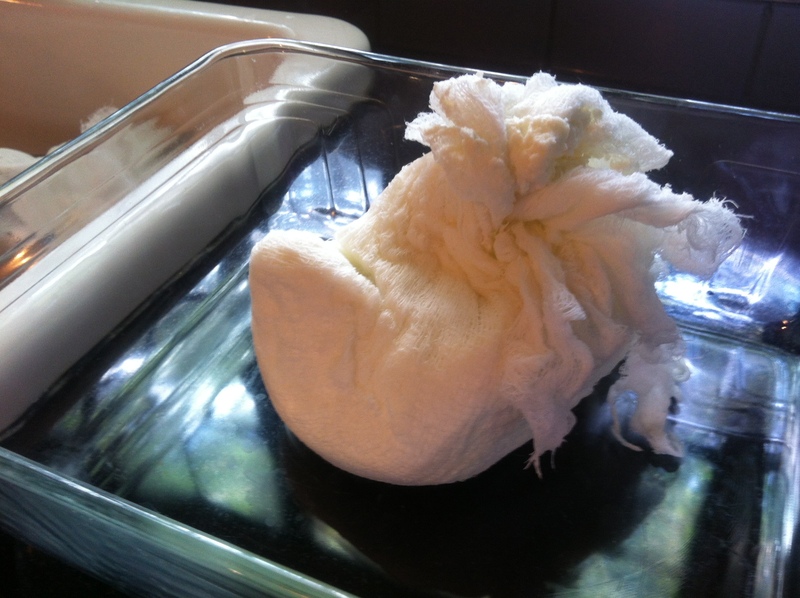 In either case – let it cool a bit & then wrap it up in cheesecloth and squeeze out as much moisture as you can. Repeat with the other half of the ingredients. Unwrap the ricotta from the cheesecloth & put in a bowl & set aside (or chill). 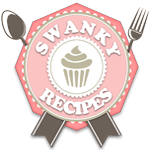 Spray your cupcake pans with a nonstick spray. Place a wonton into each cup – letting the corners stick up & out. OR – use a cookie cutter & cut the wontons into circles the correct size for your tray. Layer with a little grated Parmesan, then ricotta then sauce. Add another wonton – putting the corners in the opposite direction the first wonton was placed and press it down on the first layer. Add another layer of Parmesan, ricotta and sauce & top with another wonton. 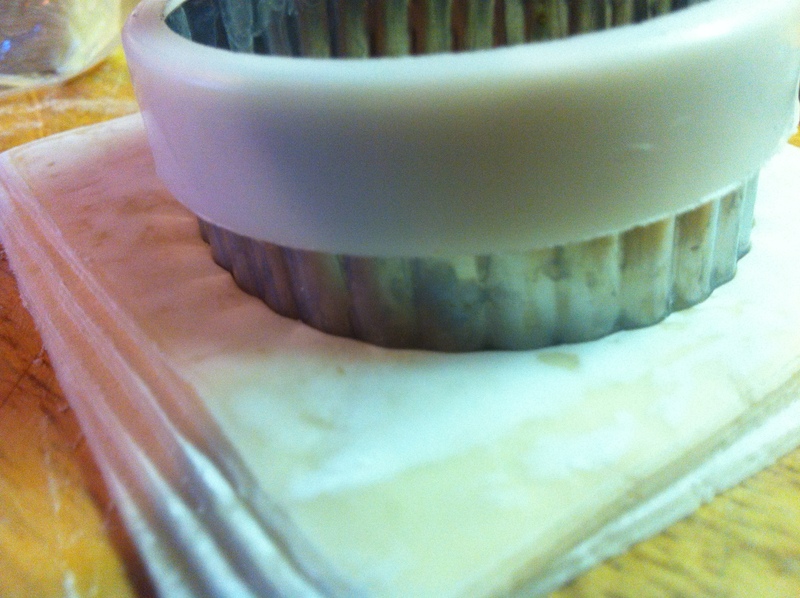 I used a round-cut wonton for this top layer even if I left the corners on for the first two layers. Top with some sauce & then press the corners of the wontons down into the sauce so the cupcakes all stay “closed.” Be sure a little sauce is covering the entire surface. Top with a sliced disc of fresh mozzarella. Put these in the oven & bake. Check them at the 15 minute mark. They should be done in between 15-18 minutes. Remove from the oven & let sit & set & cool for five minutes. Carefully run a knife around each cupcake & pop them out onto a serving dish. Garnish with shredded fresh basil & some chopped fresh tomatoes (if you are using them). If you used all rounded wontons in the Neapolitan style – let sit longer than 5 minutes as this version is more smooshy & fragile. 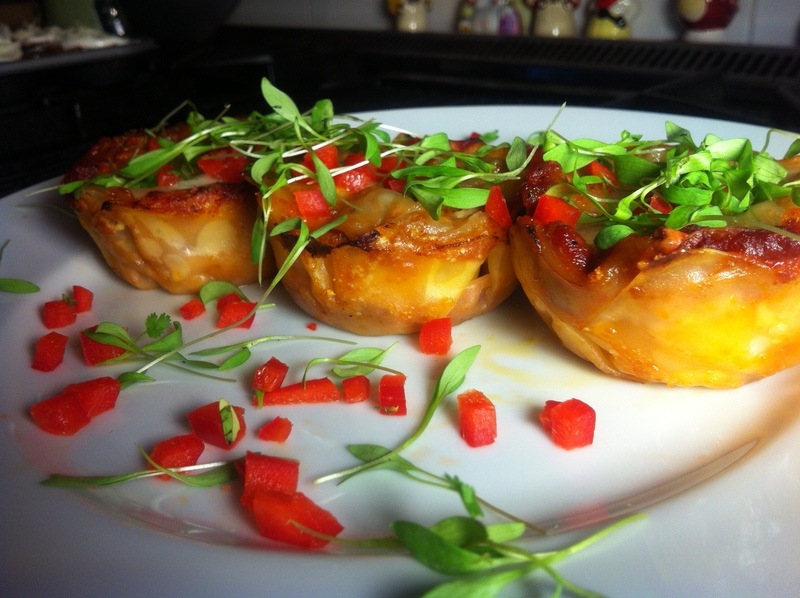 The squared wontons look prettier – as you get a nice golden “crust” around them but both version are delicious! Sounds awesome. Can’t wait to try. You are a freakin’ GENIUS!! This blog is sooooo beautiful. Truly, dude. Beautiful! Cute usually isn’t the best word to apply to food, but little things really are cute. 🙂 You’ve inspired me to try to make ricotta. Thanks! 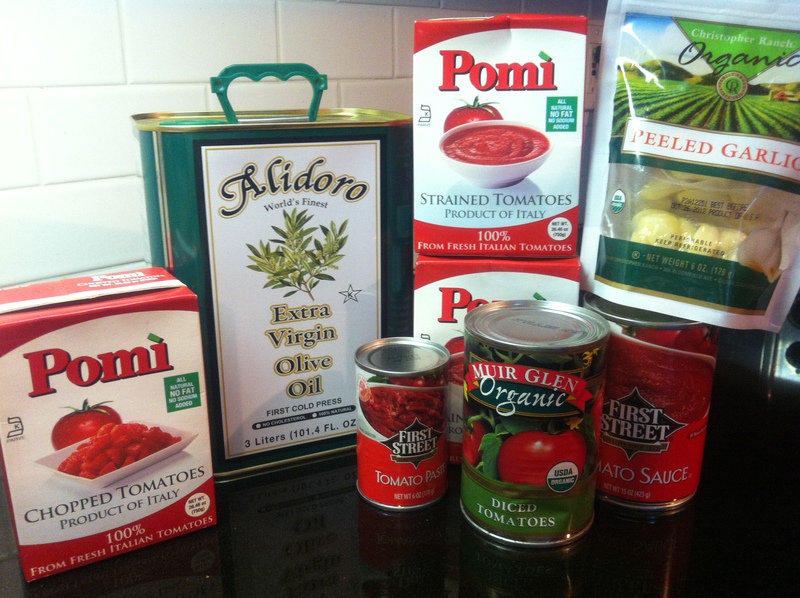 Thank you for the helpful link on canned tomatoes. It was good to gain some new insight. We’ve been concerned about BPA in canned goods, too. Not having tetra-pak or jarred tomatoes in our area, we’ve been limiting our exposure by not purchasing other canned goods and keeping our tomato use low. Canned tomatoes and pumpkin are the only two things we purchase in cans now. Cute overload in food form — gots me all the ingredients to power cook this wknd for the lunch boxes. Great idea on the wonton wraps!